For those of us in cold places, a Spicy Red Curry and Coconut Noodle Soup with Shrimp to warm up your day! Happy Sunday everyone! Fill a large pot with water and bring to a boil. Add noodles, cover and remove from heat. Allow noodles to soak/soften for about 8 to 10 minutes. Drain and set aside. Pour oil into a large saucepan and place over medium-high heat. Add shallots, garlic, ginger, chiles, and curry paste and sauté until fragrant, about 3 to 4 minutes. Stir in bone broth and fish sauce and bring to a boil. Reduce heat to medium heat and stir in coconut milk. Season with salt and pepper and stir in lime juice. Once the soup begins to simmer add shrimp and poach for 4 to 5 minutes. Add noodles and continue to simmer for 2 to 3 minutes. You can discard the chili peppers halves if you wish. Adjust seasonings and top with cilantro leaves, bean sprouts and serve with lemon or lime wedges. This super easy Pho broth, with a whole lot of goodness, looks pretty good right about now. For breakfast or a snack, simply heat our Bone Brewhouse Pho bone broth and pour into a bowl with greens and a soft boiled egg. I used fresh watercress and bok choy. It was delicious. Happy Sunday! Our Pho bone broth is aromatic, perfectly spiced and better than chicken noodle soup during cold and flu season. 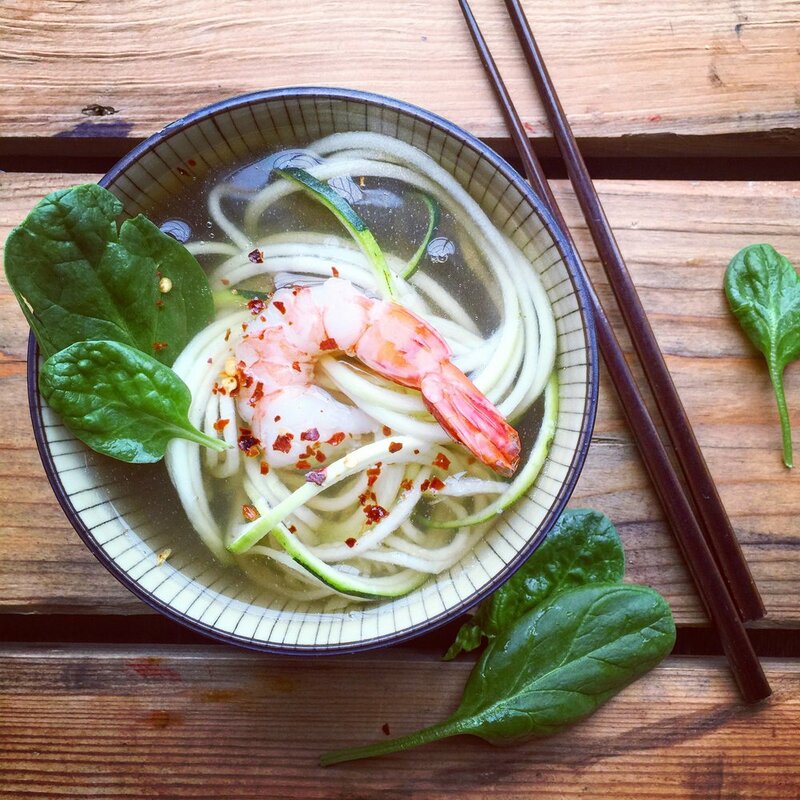 I created this protein-packed version of a Vietnamese-inspired soup by simply adding udon noodles and garnish. I can’t wait for you to make this soup…and the flu isn’t required to do so. Bone Brewhouse broths are all natural goodness. No starches, gums or added colour. Ideal for Paleo and protein-based diets.